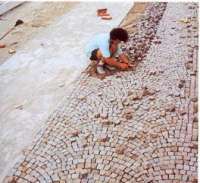 This describes the laying of setts in an unbound method using crushed granite bedding aggregate and jointing aggregate with limestone dust for the topping. No cement is used. The setts are held in position by the jointing aggregate surrounding them, acting with the setts next to them. The outside edge of the area of the setts must be restrained. This may be achieved by laying up to walls, buildings, kerbs or channels or by being haunched in concrete. The sub-base needs to be strong enough to carry the anticipated traffic; the setts are a wearing course. The method is suitable for driveways, commercial access ways and parking areas rather than public streetscape projects as cleansing of the streets by machines using suction, powerful water jetting and rough brushing will remove the jointing aggregate. These actions will also reverse the natural migration of fines down through the aggregate matrix and lead to failure. Many city streets were laid unbound in this fashion, a century or more ago as were railway goods yards, docks and factory yards generally. The setts had the time to compact really thoroughly with use before the advent of today"s juggernauts so could later carry today"s loads. Newly laid setts cannot immediately achieve the same compactness to carry the heaviest traffic. While the whole surface retains its integrity, it will be remarkably successful as a resilient load-bearing surface and last a lifetime. So, if at any stage after completion, the jointing material becomes depleted, the joints must be refilled forthwith and, should there be any type of minor failure, repairs must be effected as soon as possible. As heavy as a bricklayer"s hammer, preferably with a wide blade on the opposite end to act as a mini-shovel for manoeuvring the bedding aggregate. To indicate levels to work to. A little, low one-legged stool to sit on. Setts must be cropped on the sides. Sawn sides do not bind sufficiently with the jointing aggregate. The top surfaces of the setts may also be cropped or they may have a naturally flat or a sawn, then textured, surface. Ideally, but not necessarily in every case, the bottom should be rough or naturally flat rather than sawn. There are so many possible options. For laying unbound, the optimum for long-lasting results in traffic conditions is to lay the setts in arcs. This spreads lateral loads over a wide area and avoids lines of weakness. If setts are to be laid in rows, they should always be laid with a staggered bond if there is vehicular traffic. Even in purely pedestrian areas this is sound advice to follow. Setts laid in straight lines should never be laid in rows that are parallel to the traffic flow. It is unsatisfactory both visually and technically and, specifically, bad for bicycles. 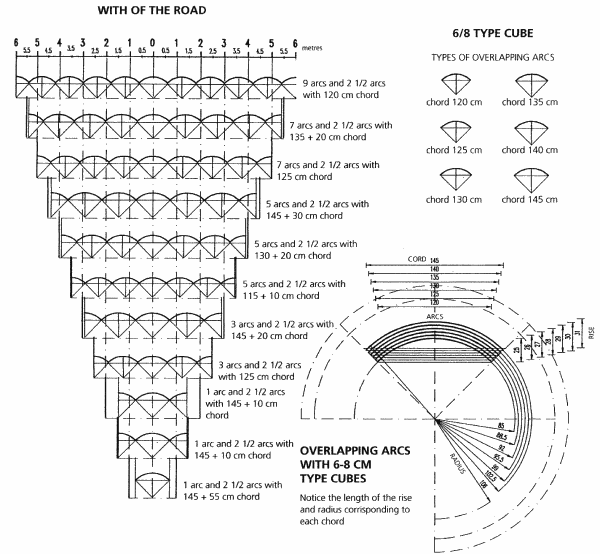 The setts may be laid in rows that are perpendicular to the traffic flow, which is traditional, but they may also be laid at 45� or even somewhere in between. 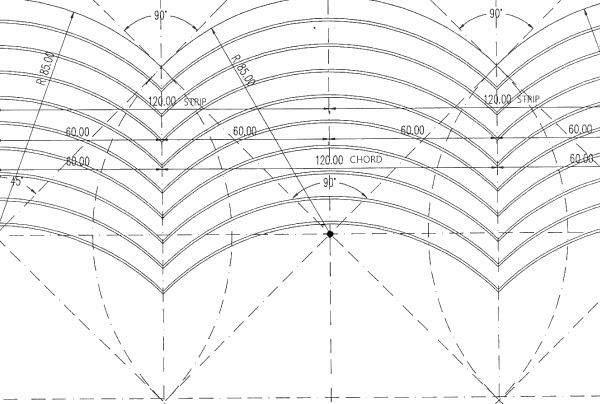 The definition for laying areas in arcs is more complex. One should think about the arcs as arches transferring the strain on the bridge down to the supports. On the road or driveway, repeated strain is usually through braking and acceleration. On the horizontal with modern vehicles, the forces resulting from braking are generally greater than from acceleration so, from the driver"s viewpoint, he should be driving towards the heads of the arcs. If there is a slope, the heads of the arcs should lead up the slope, just as in a bridge the head of an arch supports the load and so is uppermost. The steeper the slope, the more critical this is. When laying setts in curves within an area of paving, for visual benefit the outside line of the curve needs to be laid tidily, the inside line is less important. For driveways and access routes that are not very heavily used, a cube of 60/80mm or 70/90mm is ideal to lay in arcs. Both these sizes allow sufficient difference in size to fit the geometry. If larger sizes are to be laid in arcs, special management of the plan dimensions will be needed. This is also the case if the setts being used are very accurately produced to a square plan. To be suitable for vehicular traffic, it is expensive and difficult to lay setts as small as 50mm. Laying in straight lines can be done with the same sizes but is more commonly done with 100mm cubes or rectangular setts 100x100x200mm. If reclaimed, rectangular British setts are to be used, these are commonly 150mm deep but the same principles apply. If the setts vary in width significantly, they should be sorted into bandwidths either before laying or as they are being laid. If sorting while being laid, lay 3 rows simultaneously - small, medium and large. 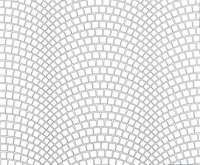 If buying new cubes to lay in straight lines, some longer setts (same width x 1� length) should be used to start alternative rows to achieve a staggered bond with some elegance. Alternate rows of rectangular setts should be started with cubes or half setts. Sub-base material, bedding aggregate and jointing aggregate, when compacted thoroughly, will all weigh 2 tonnes / m³. 1 tonne of sub-base will cover 3.3 square metres at 150mm thick, 1 tonne of bedding aggregate at 40mm thick will cover 12.5 square metres. The volume in cubic metres of the jointing aggregate required is the total surface area (m²) x depth of setts (m) x 21/121. The weight is twice this number in tonnes. Generally, when the joints are large enough for the bedding aggregate to be used as the jointing aggregate, add together the two quantities to arrive at the total requirement. If the joints are narrow, finer jointing material must be ordered separately but note that some of the joints will be filled by the bedding aggregate in the original sideways slewing motion used to place the setts. Give thought before starting to the details of the laying including entrances, gullies, changes of laying direction and junctions. Make sure your plan will deal with these tidily. Often, these matters will determine where you should start and how the site should be set out.Remember that it is normally best to work consistently and with reasonably tight joints than to try to get the joints very tight. Consistency is a real virtue. It is better to plan the work so that the spacing of the rows can find its own optimum rather than be forced to fit in a fixed number of many rows per linear metre. The aim is that the setts finish by resting on a thoroughly compacted bed, with fully filled joints and with the surface of the setts at the required height.Spread and roll/compact the sub-base to levels. The surface level of the compacted sub-base should be at a uniform depth below the finished sett surface. Set string lines 10mm above the required final finished surface level. If the target depth of bedding aggregate is 40mm, lines should be set 10 mm high because the 50 mm depth of bedding laid will be compacted 10% to finish at 45 mm and will ultimately settle to approximately 40 mm. All work must be made from the un-laid side of the face; at no time must workers stand or kneel on the setts that have been laid. Bedding aggregate must be thrown loosely in advance of each sett to be laid and adjusted by the pavior for that sett only, the same procedure being repeated for each sett in turn. Bedding aggregate must not be spread in advance of laying for more than a handful of setts; attempting to create a level bed of aggregate in advance of laying the setts is bad practice. Place the setts individually one at a time, using a sideways action to ensure that two joints are partially filled with bedding aggregate and that the sett is placed at the correct surcharge height (above the required level) in one action. Hammer down the setts individually until the arris (the edge of the sett between top and the side) and, indeed, the entire top of the sett is level with the line (lines will have been set 10 mm above finished levels). As you go, keep filling the joints of recently laid setts that remain in reach. If hammering quite firmly does not bring the sett to the required level, remove the sett and add or take away bedding aggregate till it works. Ensure that all joints are filled, using bedding aggregate as much as possible and finer jointing aggregate only if the joints are too small to take the bedding aggregate. Spread more aggregate over the surface until a thin layer of aggregate completely obscures the setts. Take a heavy powerful, Wacker (typically 40kN energy) plate and thoroughly hammer down the whole area till it is compacted properly and, if you have calculated correctly, the correct finished levels are reached. How hard you have hammered down the individual setts by hand will affect the amount of further compaction by the Wacker plate. If you can organise the first area you lay to be one where the finished level is not critical, you can learn by experience without having to relay the work. When the area has been fully compacted, remove all surplus bedding aggregate from the surface of the setts. Cover the surface, completely obscuring the setts, using the topping aggregate, a very fine aggregate dust. Using a hosepipe, apply water generously until the fine aggregate dust is as completely as possible taken up by the joints. Repeat this once a week, then once a month and until no more topping material can be taken in by the joints. (Note that this action covers what is needed for the heaviest usage for which this method is suitable) After hosing, apply more fine aggregate dust to the surface and maintain a covering of the surface with this dust, not obscuring the setts but leaving them noticeably “dirty” for a minimum of 1 month, preferably up to six months or longer. When first complete, the whole surface will be porous and perhaps 10% on average of rainfall will percolate through the joints rather than run off the surface. When many years have passed and dust and dirt have filled the pores in the joints, only perhaps 1% will pass through. Especially in the period soon after completion, heavy rain may wash out some of the joints. Return immediately and refill the joints as necessary. Any failure or disturbance of the surface needs immediate and thorough attention. This ensures that the structure does not suffer from cascade failure, where removal of one sett takes away the support from the next one. Wherever setts can be laid unbound, without cement, this is how it should be done. It is cheaper, uses less of the world"s resources and has a very much lower carbon footprint. The setts can be lifted easily for underground cables or pipes and re-laid successfully and seamlessly afterwards - but this needs doing with the same attention, care and skill as the first laying. There is never going to be an issue with cleaning off surplus cement from the finished surface, it always looks good. First timers, be patient. Take everything step by step and take care with the workmanship. Avoid having to redo your work. Speed comes later. Properly laid, this surface will be sound for a very long time indeed. It is impossible to cover every eventuality in this guidance note, though we hope we have dealt with the majority. Do, please, ask about anything that is unclear or not covered and also about the availability of the materials you want in good time. Many are usually in stock, but not all. Available from: CED Ltd at a subsidised cost of £20.00 (collected), or £24.50 if posted to a UK destination. All the photographs and drawings included here have been taken from The Porphyry Manual, a wonderful exposition of what can be achieved with Italian Porphyry. Much of the information can be applied to other materials and it is a most useful work. Even though the translation is not perfect and care must be taken as a result, we have found it to be such a help to clients. The information given concerning both specification and methodology is intended for guidance only. Sites vary considerably, so we recommend strongly that you seek professional advice.